MUNICH — Contrary to a London blog report yesterday, nothing has been “locked down” with regard to a contract extension for Valery Gergiev at the Munich Philharmonic, though things are indeed moving in that direction, for practical more than artistic reasons. What has happened is that Hans-Georg Küppers, Kulturreferent of the City of Munich, which operates the orchestra, has gone public with his resolve to recommend a full five-year renewal for the Russian maestro to the city council at its scheduled Feb. 21 meeting. Any contract-signing would naturally take place later. 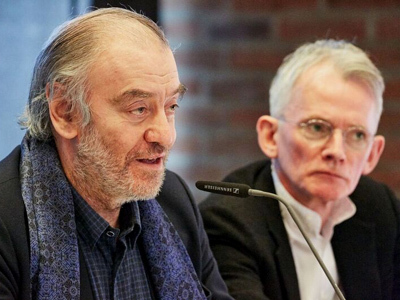 Küppers, MPhil Intendant Paul Müller (pictured last year with Gergiev), and Munich Bürgermeister Dieter Reiter are all inclined on continuity because 2020, when the present contract expires, heralds the lengthy and probably tortuous closure of the MPhil’s Gasteig home for gutting — at which time the musicians must decamp for a temporary wooden hall next to a power plant up the Isar River. Gergiev has been no more of a musical success here than anyone predicted, but the high tensions around his friendship with Vladimir Putin — at fever pitch in 2013 when he was hired — have abated, and artistic decision-making since he began his tenure 29 months ago has gone smoothly. Regarding other jobs around town, rumors persist that Vladimir Jurowski has joined Andris Nelsons im Gespräch for Kirill Petrenko’s position as Generalmusikdirektor at Bavarian State Opera. Petrenko steps down in fall 2020 after an unprecedented single season as head both of Germany’s largest opera company and of the Berlin Philharmonic. No rumors are yet floating about a successor to, or a renewal for, Mariss Jansons, whose contract at the Bavarian Radio Symphony Orchestra is up one year after Gergiev’s. This entry was posted on Wednesday, January 31st, 2018 at 8:58 am	and is filed under Munich Times. You can follow any responses to this entry through the RSS 2.0 feed. Both comments and pings are currently closed.